Home Genre Crime Fiction Abraham Lincoln Wrote A Murder Mystery – And It’s Actually Pretty Good! 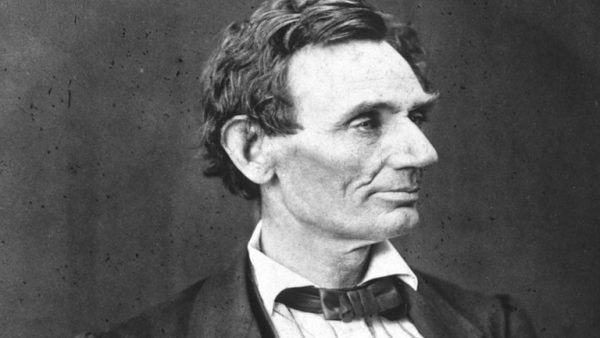 Abraham Lincoln Wrote A Murder Mystery – And It’s Actually Pretty Good! Before he became the 16th President of the United States, Abraham Lincoln dabbled in another career: writing mysteries. In the 1840s, Lincoln was working a day job as a lawyer, but at night he entertained wilder dreams. Lincoln was reportedly a huge fan of Edgar Allan Poe. He devoured every one of Poe’s works, taking a special interest in his mysteries, and he soon found himself wondering if the strange stories he”d gathered in the courtroom were interesting enough to sell. In 1846, Lincoln gave writing a shot. He sat down and sketched up a fictionalized version of a real court case he’d taken part in, sent it in, and got it published in his local paper, “The Quincy Whig”. Lincoln’s little mystery didn’t make a splash and he never became a famous author – but he did get one little story published. Lincoln’s mystery is full of plot twists that keep you guessing. It tells the story of three brothers named “The Trailors” who are accused of murdering a man named Fisher for his inheritance. One of the brothers, named Henry, is insisting that his brothers are guilty – but a local doctor claims that Fisher isn’t alive and just out of town. This is a story from a time before cell phones, so the jury ends up forced to rule on a murder case without even knowing whether the victim is dead. In the end, they let the Trailors off the hook, saving them from a certain death by hanging — and Fisher waltzes into town in perfect health. The most surprising part about the story is that Lincoln isn’t that bad of a writer. Lincoln’s no Edgar Allan Poe, but you can see some potential in the story. He keeps the suspense and mystery alive throughout the story. He seemed to take incredible pleasure in writing it, as well. He ends the story a little boastful: “it may well be doubted whether a stranger affair ever really occurred” that gives a glimpse into the young man who wrote it. 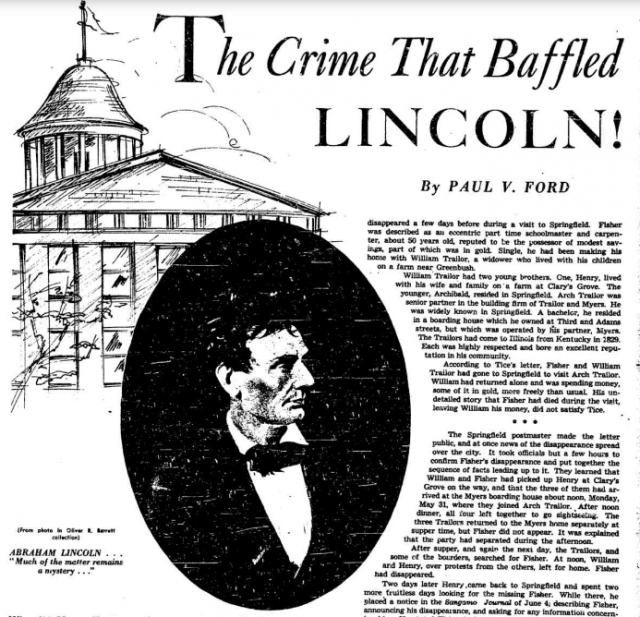 In Lincoln’s mind, this was the case that would define him – and the Trailor Murder Mystery would be the story that people would remember him by. It’s based on a real case – Lincoln himself was the Trailors’ lawyer. This in itself wasn’t too unusual — lawyers in the mid-1800s would often adapt their cases into works of dramatized fiction. Lincoln, though, shows a little sensibility by making the decision to write himself out of the story and making it feel a lot less boastful. There are countless unanswered questions at the end – partly on purpose, and partly because Lincoln really didn’t know the answers. Why, for example, was Henry so insistent that his brothers had killed a man who was still alive? It leaves a lot open for the readers to debate – mostly because the real case did, too. The real Trailor case received its fair share of press. If you read the real news reports, you’ll find out that Lincoln may have fudged a few details to make his clients appear more innocent. It’s tempting to write the case off as police brutality bringing out a false confession, but there seems to be a bit more to it than that. Fisher was epileptic, and when he showed back up in town he wasn’t in the perfect health Lincoln claims. Instead, he had a bruise on his head – as if somebody had tried to batter him to death. Some believed that the Trailors really did try to kill him, but Fisher went into an epileptic fit – and they left him for dead. When Fisher came to, he believed he’d just had a fit, and wandered off for help, completely unaware he’d just escaped an attempt on his life. Which means that there’s another crazy revelation about Lincoln. If the theory’s true, Lincoln didn’t just write a mystery book – he got a guilty man off the hook for murder. The Trailor Murder Mystery is in the public domain. You can read it for free, here, or listen to the audible version, here. What are your thoughts on Lincoln as an author?